…only the party didn’t kill the goblins as you’d intended. 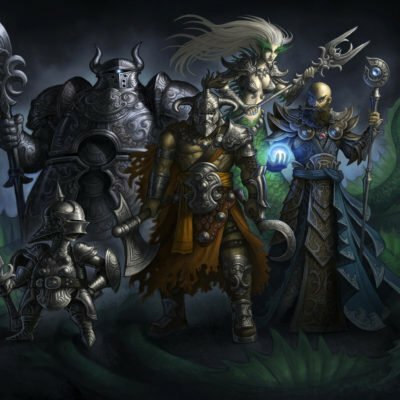 Not only did they avoid fighting them, they entered a parley with them, bought the loot from them (to re-sell at a profit) and hired the goblins to sell them any other goods they might scavenge. 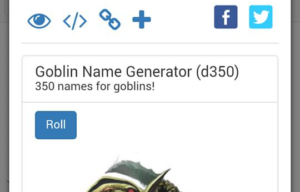 An interesting twist, to be certain, but now you have to come up with six goblin names on the fly to serve as recurring non-player characters. Now, there’s a few options here. You can just rely on your own imagination, but not everyone is good at coming up with character names, much less six names in an instant. Maybe you have a name generator table that you rely on, but you need to find the book in your stack, find the right page, make multiple dice rolls and collate your information. All the while, your players grow impatient! 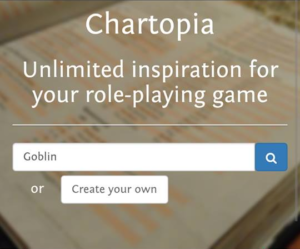 Chartopia is a web-based application designed so that you always have flexibility, inspiration and creativity on-hand during the running of any RPG, despite the unexpected twists your players may make. It provides convenient access to a massive library of random tables to satisfy the needs of any dungeon master, game master or players, all in the palm of your hand. There’s no longer any need to sift through a stack of rule books to find the perfect table. If you’re old school and like the tactical act of rolling, you can view the table and roll your own dice, but immediate random table results can be produced with the simple press of a button. Currently there are hundreds of tables available for use right now. 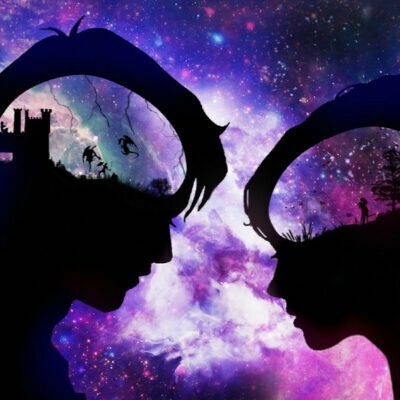 Need help determining encounters? 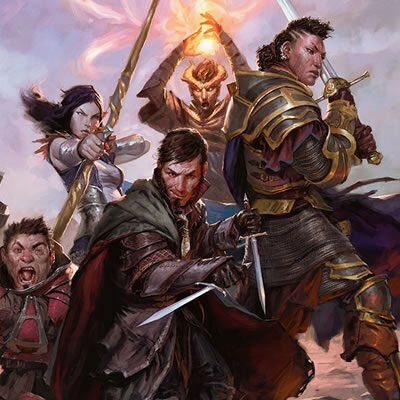 What about figuring out what loot your party should receive? Perhaps you need to find basic descriptors for some NPCs? 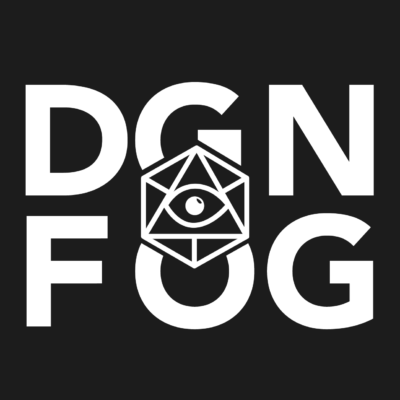 What if you don’t play in a fantasy setting and need a mission generator for a Star Wars game, some eastern european names, or perhaps a scenario for your horror scene? Chartopia has you sorted with its ever-growing table library and easy-to-roll mechanics. So as I said before, you’re in need of some goblin names. A quick search on Chartopia finds a thorough table giving me three hundred and fifty possible results. Chances are you don’t have a d350 on me (and if you know where I can buy an actual d350 please let me know, I’d love to add it to my collection) so you can just press the ‘roll’ button until you’ve got enough names you like. 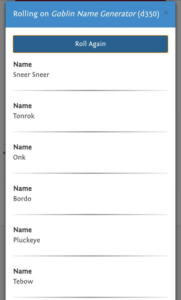 And just like that, you have six great names: Sneer Sneer, Tonrok, Onk, Bordo, Pluckeye and Tebow. You can quickly note them down and continue playing your game. Now, if you decide that you need this generator readily available be sure to click the plus at the top of the table to add it to an easily accessible list of folders for frequent access. 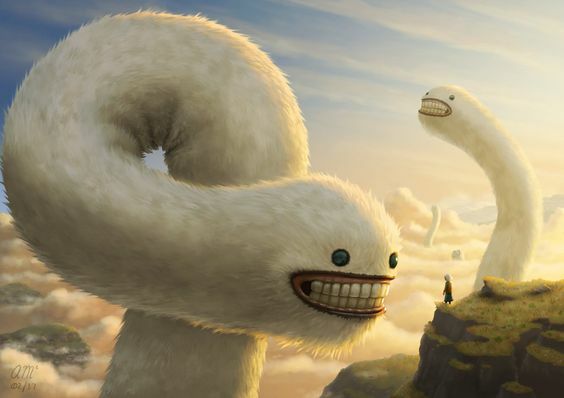 Note: this feature requires you to create an account. Tavern Name Generator (by Alpacaone) for an amazing variety of names for your tavern, bar or inn. Dungeons and Dragons 5th Edition Treasure Hoard List (for levels 0-4; 5-10; 11-16 and 17+) condenses the many dice rolls across many tables (from the treasure section of the 5th Edition Dungeon Master’s guide) into a single button press; it tells your players exactly what their treasure and magic items are immediately. 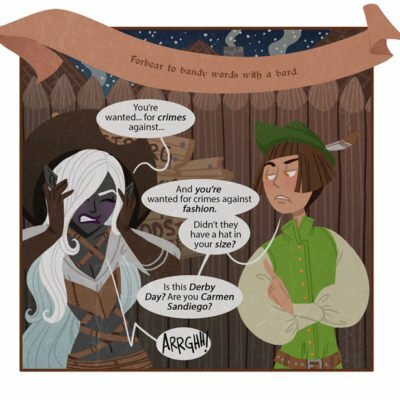 Inspirational Bardic Quotes (by Jaekido) for a simple example of how Chartopia can benefit players as well as Game Masters. "From the faraway lands of New Zealand, Scott Beccard has been a board gaming and video gaming for as long as he can remember. 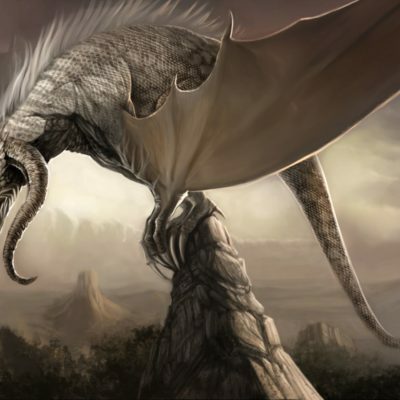 Role-playing was introduced to him when he was at university through the Star Wars d20 system. He's played a lot since then, in varied gaming systems including different versions of D&D going back to the Basic Rules. These days he gives back to this hobby he loves whenever he can, encouraging new players to try it out and helping them join regular groups."